How To Make Your Guests Love You - 5 things you need to consider for your wedding day NOW! While everyone at the wedding is there to love and support you let’s be honest for a sec, guests aren’t always overflowing with patience on your wedding day. Now this isn’t a post to bash either party or call anyone names, but rather let’s lay out a few truths and a few more strategies, to be the host-est with the most-est on your big day. If you don’t know what a first look is (have you been under a rock?) it’s a special moment, typically coordinated by your photographer, where you and soon-to-be-spouse see each other before the ceremony. 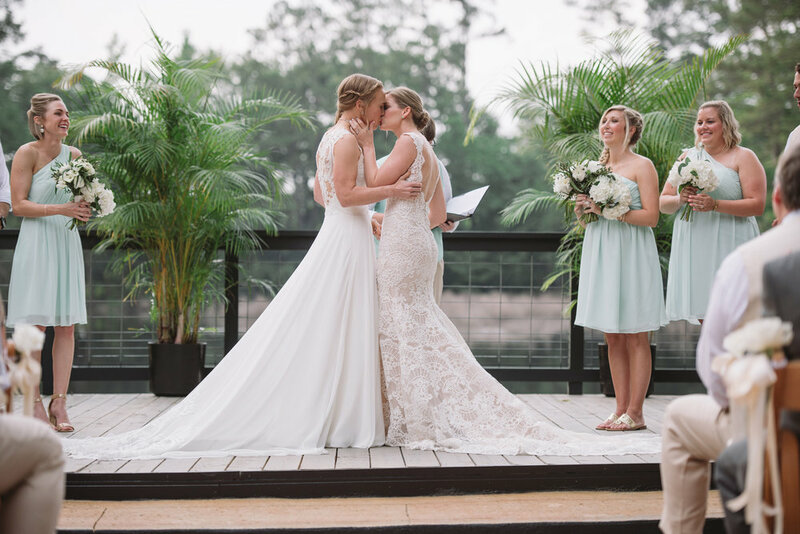 First looks can be incredibly special and touching on a wedding day. It’s a wonderful chance to get out all your nerves, and get the jitters over and done with. The main purpose of a first look though is your timeline. Getting to see each other before the ceremony allows you and your photographer to take care of not just portraits of the two of you, but your bridal party as well. Think of all that time saved between the ceremony and reception! Plus you can get a ton more of those killer photos you know you’ll want. What this really does for your guest? It keeps the cocktail hour to a nice and tidy 45 minutes and your guests grumbling about having to wait for the bride and groom to a solid zero. 2. For Pete’s sake send out the food! Imagine you’re a guest. You just sat through a 30 minute ceremony and drove another 20 minutes to the reception where you had to find a parking space and schlep your way into the venue. You’ve already knocked back two glasses of wine, and you’ve been eyeing the tables trying to decide where to set up base camp for the rest of the evening. It’s now 2 hours into your evening and you’re ready for some grub. That fruit and cheese display was cute but it’s real food time. I promise the last thing your guests want to see is the beautiful full buffet of mouthwatering food sitting there in chafing dishes. The couple has decided to hold the food until they’ve made their entrance and done all the first dances. It’s a common situation (and if it sounds familiar, no hard feelings). It’s super simple. Feed the guests. Let them enjoy all the tasty things you’ve picked out while you’re off doing photos. When you do finally make your grand entrance, your guests will be two glasses in with full bellies ready to hug you and shower you with love (and thanks for the grub!). Got an August wedding and you still want to get married outside? That’s great! Just make sure you have some creature comforts at the ready for your glistening guests. Bottles of water, fans, an air conditioned place to wait until ceremony time are all options and items that will leave your guests feeling appreciated on your special day. The same goes for cold. If you’re planning a winter wedding in the cold, have shawls, blankets, and heaters for your guests to stay warm and cozy while they wait for you to walk down the aisle. What this really boils down to is flexibility. The timeline for your wedding day isn’t a stone tablet that’s been chiseled with the 10 Commandments. It is a living thing that can go with the flow of your day. Your timeline should be a rule of thumb; a guideline for how your day should proceed. We always tell our clients that our photo timeline is what we strive for. Our max time allowed. If we get done sooner, great! We can move on to the next thing. Same thing with delays. If we planned for your ceremony to take 30 minutes but your musicians decide to take and extra 2 choruses of Eternal Father, things are going to shift in your timeline. Success comes from being ready to adapt as the day progresses and don’t stress when your schedule shifts. No one wants their party to end. You imagine everyone dancing to “Shout” into the night. The reality is that your guests have a limit. Everyone can only drink, eat, dance, and mingle so much. If you’ve planned on a 5 hour reception and guests start trickling out after 4 hours, it’s great to be flexible enough to end the party on a high with a larger group of guests. Everyone will remember partying all night long instead of looking at their watches.